How to improve user experience and security? To protect the resources of your organization, different access control measures are used. Most often, the user must go through the authentication process via some method, for example, entering his login and password. In a modern organization employees work with dozens of applications, and each application requires authentication. Increasingly, organizations use SaaS — in this case, employees enter passwords into applications that are installed outside the organization. This is a nightmare for the user: the security policy requires the use of different passwords, the passwords can not be written on the sticker and glued to the monitor, they can not be made simple and must be changed several times a year. Using the authentication server Blitz Identity Provider , deployed on-premise, the employee has to get access to his account only once (logging into domain or entering the password into the web form). After it he can immediately go to all applications of the organization, that is provided by Single Sign-On technology. Enhances employee convenience. Now you only need to remember one password and enter it only once. Improve security. User passwords never leave the organization and the password itself may meet stringent requirements. Safe the investment. 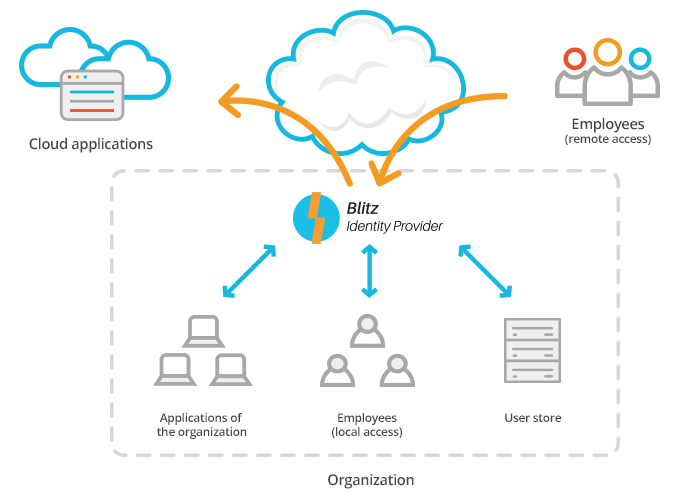 You do not need to give up you current IT-solutions, since the Blitz Identity Provider is integrated into the existing infrastructure and extends its capabilities. Configure the application to use an external identity provider by configuring integration using WS-Federation, SAML, OpenID Connect. Most popular On-Premise and SaaS applications have support for such integration or plug-ins that add this functionality. Connect the application through a Web proxy. In this case, all requests for the user to enter the login and password will be intercepted and processed by the Blitz Identity Provider itself.